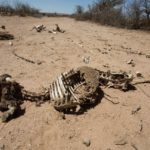 The Namibia Agricultural Union (NAU) in cooperation with the Namibia Emerging Commercial Farmers Union (NECFU) has urgently requested the Minister of Agriculture, Water and Forestry to declare the 2019 drought as National Disaster. The NAU stated that this action is needed to look for further international support. According to independent reports the rangeland condition on 92% of all land in Namibia is below normal, while a staggering 64% of the total country has a vegetation cover of less than 20% of the normal. It is further estimated that the water currently available in the Hardap dam will not be able to sustain irrigation at current levels until the end of 2019. “Pressure on current livestock marketing channels is immense with plummeting auction prices due to an oversupply of especially lean animals. Furthermore a large part of the dry-land maize harvest is already destroyed. Feedback has been received from the office of the Prime Minister that they are busy with the prescribed process in order to enable the President of the country to declare a National Disaster,” the NAU noted.